Pastor John Lowe of the First Holy Temple Church of God in Christ wishes pastors, including himself, did more to combat the violence. "There were times I was stronger. I'd pray all night to get an answer and wouldn't stop." 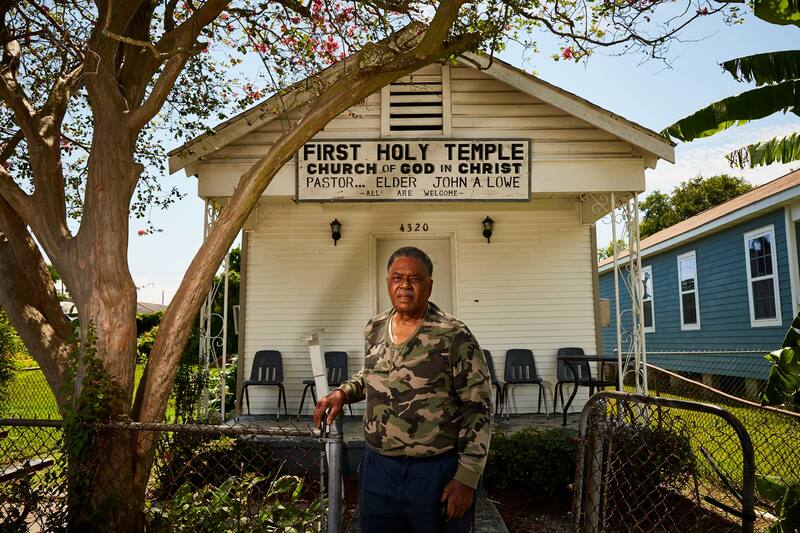 In 2012, his son caught a stray bullet while leaving a gas station in the Goose neighborhood of New Orleans. In March of this year, his church took three bullets, including one through the front door. Lowe, who lives across the street, attributes it to a drive-by shooting. He feels some preachers aren't doing enough to meet the needs of the communities they are supposed to serve. He says many churches only open their doors on Sunday, then dismiss worshippers until next Sunday. Fear, he believes, has led them to rein in after-school programs and Bible studies that help keep kids off the streets. Lowe wishes he could do more himself, but at 87 he's hampered by bad knees and age. He crosses the street from his home to his church aided by a cane. "I feel guilty because I can see some breakdown in the church from where we used to be five or 10 years ago," Lowe said. "We aren't building up the spirit of God in the lives of people. The Bible tells us together we stand, divided we fall. And that's where we are today."